The opposing announcers were tough on Scott Anderson. Anderson was a career-minor leaguer. His only previous time in the majors, three years earlier, resulted in an ERA over 9. Former Anderson teammate Steve Fireovid relayed the account in his book on the 1990 season, "The 26th Man." It was an account of his friend and roommate's one major league outing that August. And, he wrote, all Fireovid could do was shake his head. "The Expos needed a pitcher, and Scott deserved the promotion," Fireovid wrote. "He's worked hard all year. Of course, I'm biased. He's a good friend of mine. But I also know that nothing was handed to him." Anderson returned to the majors one more time that season. He also returned one more time after that. In that last return, though, when Anderson got his one and only major league win, others had the opportunity to be tough on Anderson. Anderson's career began in 1984, taken by the Rangers in the seventh round, out of Oregon State University. He played that first year as a starter at single-A Burlington, making AA Tulsa in 1985. Anderson made AAA Oklahoma City in 1986, moving to relief. He then debuted in Arlington in April 1987. With the Rangers that month, Anderson got into eight games, all in relief. He pitched in 11.1 total innings, giving up 12 earned runs. He picked up one loss to no wins. He spent the rest of that season and the next back at Oklahoma City. 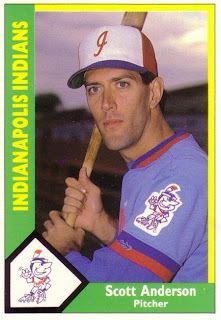 He then moved to the Expos for 1989, playing at AAA Indianapolis without a call up to Montreal. Anderson also returned to starting, starting 19 games for Indianapolis in 1989 and 25 games in 1990. Anderson returned to the majors that August in 1990. In that one outing, Anderson went three innings in relief against the Cubs, giving up three hits and one earned run. He returned to the Expos for three more outings in September, all three starts. He only got one decision, a loss. Then Anderson didn't return to the majors again until 1995. In the meantime, he moved to Japan, playing two seasons with the Chunichi Dragons. He returned stateside in 1993 with the Marlins, playing at AAA Edmonton, then with the Brewers at AAA New Orleans in 1994. Then, Anderson signed with the Royals. He signed as a replacement player. He also pitched well, not allowing an earned run in nine innings, garnering praise from his manager, Bob Boone, according to The Associated Press. "Anderson has been very impressive in games and working on the sidelines," Boone told The AP. "I saw him pitch in the Pacific Coast League. If he's healthy, he'll be a quality pitcher in this league. The only thing that concerns me is his health." Anderson stayed healthy. And, after the strike ended, he stayed on with the Royals at AAA Omaha. Injuries got Anderson called back up in late-July. Anderson got into six games for the Royals, his last in the majors. After his debut, The AP referenced Anderson's time as a replacement that spring, writing Anderson "may be the loneliest man in the clubhouse." Anderson, though, was focused in that debut. He also got his only major league win. "Once you get here, it's not enough just to be here," Anderson told The AP. "You have to do well. Just be consistent Stay out of the big inning. You have to keep setting new goals for yourself."